A popular pet tortoise, Russian tortoises are one of the most readily available tortoise species. They are small, making them easy for most people with limited space to keep. They are also feisty, eager to eat and more active than some other tortoises. When allowed to burrow, Russian tortoises also have one of the highest tolerances for temperature extremes. Russian tortoises are very round in shape when viewed from above, certainly compared to most tortoise species, and generally have a flattened top to their shell. Their color is somewhat variable, but usually is a mixture of tans and browns, occasionally with some greenish color to it. The plastron is mostly black. Their skin color, including all of the head, is usually tan, dark gray or brown. For a very basic setup, many people use the large plastic concrete mixing tubs that are available at hardware stores, or the under-bed sweater boxes available at many sources. You want the footprint to be as large as possible. Ideally, a single adult 0.1 meter (4 inches) + size should have an enclosure at least 0.6 x 0.6 meters to 0.9 x 0.6 meters (2 x 2 feet or 2 x 3 feet). The walls of the enclosure don’t need to be high, usually 0.2 meter (8-10 inches) wall height will contain them. It doesn’t hurt to go taller, but it makes accessing the cage more problematic. Cage furniture can be kept pretty minimal. A large flat rock or two is useful in the indoor enclosure because it will help maintain healthy toenail length as they walk around on it, and used as a food platter, it will maintain their healthy beak also. Outdoor housing is our preferred method for keeping Russian tortoises, as we are fortunate to live in a climate where they can be housed outdoors all year and kept with very little maintenance. We range from about 20 degrees up to 115 in an average summer, and with a proper setup, they do very well here. Because of the air exchange issue with outdoor enclosures, we prefer that they are about 1.5 x 2.5 meters (5 x 8 feet) at a minimum with fences generally 0.3-0.4 meters (12-16 inches) above ground and buried 0.15 meter (6 inches) below ground. Russian tortoises will occasionally dig around in a corner, but you can place a large flat rock there and bury it a bit and they quickly give up, at least in that corner. We build wood hide boxes in every enclosure with a small door that gives the tortoises a place to retreat to from the sun, and it is usually where they will hibernate through the winter. The boxes don’t need to be large, just enough for each tortoise to fit and then maybe 50% more space so they can arrange themselves within it. We put a 6” layer of sand or cypress in the hide boxes for burrowing and hibernating. We like to provide all indoor tortoises with at least one hide area if not two (one in the cooler part and one in the warm area of the enclosure). For young adult Russians, our favorite substrate is cypress mulch. It’s commonly available, retains moisture or dryness well, isn’t very dusty and provides a stable platform while allowing burrowing. With baby Russian tortoises, we usually use coco coir and sometimes peat moss, with a preference for coco coir. 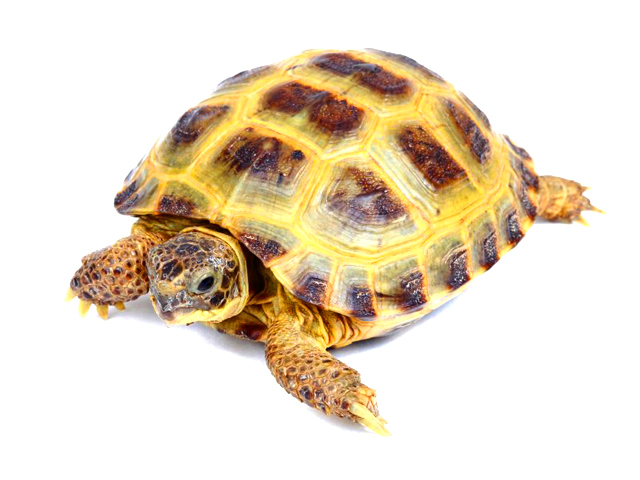 In our opinion, sand should not be used as a substrate for indoor tortoises. It remains loose indoors, sticks to food items and gets eaten, and can be a major irritant to the eyes. We have never had impaction problems with cypress or coco coir, and while there probably is some risk potential with any substrate, they should be fed from a plate or platter rather than directly from the substrate. Russian tortoises don’t need a heat source at night as long as they are heating up properly during the day. In an indoor setup, we generally recommend that the hottest part of the enclosure be somewhere around 35-38 °C (95-100 °F), directly under the basking bulb. Keep in mind, the tortoise’s shell will be 2-3 inches higher than this, closer to the bulb, so in the early setup days we would place a rock the size of a tortoise under the bulb and let it “max out” in temperature, and then measure the surface temperature of the rock. It’s often much hotter than the surface just 2 inches below it, so you want the tortoise to max out around 38 °C (100 °F), not the substrate. Babies are probably best kept between 32-35 °C (90-95 °F), as they dry out faster and don’t really need it as hot as the adults prefer. The hottest part of the enclosure should be limited to about 10-20% of the square footage in the enclosure, and the rest of the enclosure should taper down to room temp. All heat and lights should be off at night. This day/night light and temperature cycle is important for tortoises and helps them establish natural patterns. Water is very important for all tortoises, but it’s extremely important for baby tortoises. Heat dries them out quickly, particularly as babies, so while they can handle heat for some time, they need their water intake both in physically drinking and in humidity to be keeping up with it. Babies in all species should be soaked in shallow, warm water for a half hour at least 3-4 times a week. Soaking them daily is even better, in my opinion. With adults, it’s much less critical, as their shells have hardened, skin thickened and they have adapted to the ability to hold water within their bodies much better than babies. There are no baby tortoise species we raise that we don’t keep moisture in the substrates, and all species have access to a hide box that maintains extremely high humidity (over 80%). We often suggest spring mix greens as a good “general” diet for Russian tortoises because it’s easy and available all over the place. The variety is good in spring mix, but a more ideal diet would be leafy weeds like dandelion, plantain, mallow and leaves like mulberry, grape, hibiscus and pumpkin/squash leaves. Adding some or most of these items to the diet of your tortoise will do great things for them, and the roughage in their digestive system helps to keep them healthy. We also use a lot of fresh veggies such as bell pepper, squash, almost any leafy green in some amount, prickly pear cactus pads, carrots, clovers, and many other things. With smaller tortoises, we usually put these harder items in a food processor and dice them into something we can offer them in bite-sized pieces. Larger tortoises can be offered veggies as-is, and I think the fight for them to eat away at the squash is good for their strength and for their beaks. With a large enough variety in the diet, the need for supplementation can be questionable, but just to cover all the bases we offer a calcium/D3 supplement twice a week for babies and a multivitamin once a week, about half as much for young adults. Tortoises housed outdoors get calcium only a few times a year and it’s calcium without D3. Contrary to what many sellers tell customers, tortoises generally should not be handled with any regularity. They are easily stressed when over handled, and children tend to drop them when spooked. These stress factors can lead to a decline in a tortoise’s activity levels and health. All tortoises should be handled carefully. Avoid pinning them down or restricting them. Allow them to carry on in their intended way, especially when they’re young.